I have been backpacking, climbing, kayaking, canoeing and winter camping for over 10 years. My excursions are mostly weekend and occasionally weeklong backpacking and kayaking trips in the wooded and often wet, rolling terrain of western New York. I usually tarp camp with a small to large group and love to cook fun and delicious foods on my trips. In general, I strive for a compact and light pack but value well-made and durable gear over ultralight items. The Ultra-Sil Nano Dry Sack is an ultra-lightweight dry bag for use in wet conditions where the bag is not submerged. 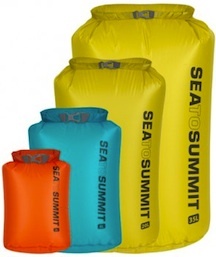 This dry bag is a waterproof sack which is sealed shut by a roll top closure that is held in place by a buckle. The seams are double stitched and seam sealed. 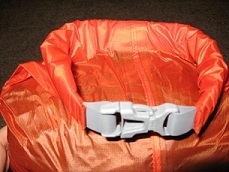 To use the dry sack I place my gear inside, leaving several inches (many centimeters) of open space at the top. Then I flatten the top of the bag, fold it over the gear, and press out as much air as I can. Once the air is removed, I carefully roll the top away from me at least three times and secure the buckle towards me. If there is too much in the sack and it is difficult to roll the top three times, I repack the bag or remove items so that I can close the bag properly. The instructions direct me to be careful to avoid abrasion and contact with sharp objects that might puncture the bag. The manufacturer also advises that the drybags should be washed, when necessary, by hand in warm water. For sensitive electronics, the manufacturer recommends using using two dry bags to ensure water tightness. 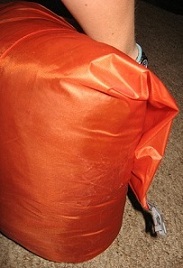 These dry sacks are really light weight. The fabric has a very fine weave and is see-through enough to read the care tag on the inside through the fabric. The roll top closure is lightweight and thin compared to the other dry bags I have used but looks well sewn and reasonably durable. The buckle has a neat design that is open in the middle. I imagine that it makes the bag lighter weight, but it also looks pretty cool. I tried filling the bag and noticed that the fabric is slightly stretchy. It did not affect my ability to fill or close the bag, but I hope that this stretch does not affect the durability of the fabric, seams, the seam sealing or roll-top closure. 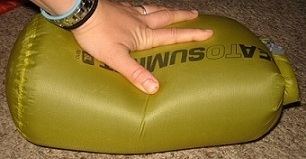 Before I use a dry sack on a each trip I do a simple test to check and make sure that it hasn't developed any holes. I fill the bag with air, and roll the top shut. I then squeeze and see if air leaks out. If there is a hole, I can generally see it when I do this test and can then patch it before I use the bag again. The dry bags I received were airtight when I removed them from their packaging. To determine the level of water protection of these bags I ran a few controlled bathtub tests. I filled each dry sack with a towel wrapped in newsprint. I then tested the watertightness in a couple different ways. I sprayed the bags lightly with water for 15 minutes (emulating a heavy rain storm). I then dried off the outside of the bag, opened it, and inspected the contents. The contents were completely dry and I found no moisture within the bag. I then put the contents back in and let the dry sack sit in the bathtub in 2 inches (5 cm) of water for 2 hours (as might happen if these were used for boating). I found that while the contents were still dry, there was some moisture inside the bag where the top had been rolled. I made it a point to roll the top only three times for these tests, so if I expect them to be in extremely wet conditions for extended periods of time I will probably roll the top more than three times to create a better seal. Over all I was impressed about the ability of these dry sacks to keep my gear dry. I am looking forward to using these dry bags on my trips this summer. The sizes look like they will be very useful for backpacking. I will report on the packability, durability, and ability to keep my stuff dry in real field conditions. Trip 1: 5-night canoe camping trip in the boundary waters near Ely, Minnesota. Temperatures ranged from 70 F (21 C) to 95F (35C) and weather covered most options including high wind, beautiful sunny days, drizzly rain, and sudden downpours. Trip 2: 2-night car camping trip to Stillwater Reservoir, near Lowville, New York. Weather was sunny and 75 - 85 F (24 - 29 C). Trip 3: Solo 2-night backpacking trip along the Finger Lakes Trail, near Ithaca, New York. It was sunny and humid for the whole trip and temperatures ranged from 57 - 88 F (14 - 31 C). Elevation ranged from 400 - 1700 ft (120 - 520 m). Trip 4: 2-night sea kayaking trip to Cranberry Lake in the Adirondack Park, New York. It was very windy, rainy, and temperatures were between 65 - 75 F (18 - 24 C). In addition to these trips, I used the dry bags on day-long canoe trips, afternoon kayaking excursions, and day hikes in the rain. These dry bags performed very well in general. On my backpacking trip they were light, easy to pack into my backpack and a good size for my clothing. I was careful to avoid placing the dry bags in contact with sharp objects or near abrasive surfaces and they remained waterproof throughout the test. They protected my gear from both rain and standing water and were easy to use. 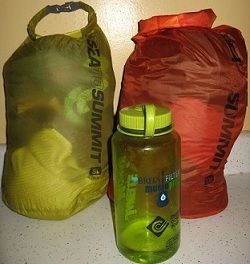 Packability: I chose to get two different colors of dry bags so that I could remember the contents based on the bag color. The bag opening was large enough to pack clothing and gear easily into the bag. I noticed that these dry bags were slightly stretchy during packing. This made me nervous about their durability, but they held up throughout this test. I found that I preferred the 8 L size over the 13 L size because I generally like to pack my gear in smaller, easier to organize packages, and the 8L bags were easier to pack into my backpack and kayak. Water Protection: The last trip that I tested these dry bags on was a sea kayaking trip in the biggest waves I have ever kayaked in. At one point I had to rescue another boat and ended up with a lot of water in my boat and both hatches. Some of my older dry bags were not watertight and had cups of water in them when I pulled them out of my hatches. These dry bags did not leak at all and kept my gear dry and protected even after traveling for hours in deep standing water. I was careful when packing them into the hatch to avoid abrasions on the boat hardware within the hatch. I really liked these dry bags and was impressed by their durability, weight, and usefulness for backpacking. They were light enough to easily replace stuff sacks for organizing my clothing and soft gear on backpacking trips, and they have the additional benefit that I don't have to worry about my gear getting wet. I will continue to use these drybags for trips where weight matters and I need to waterproof some of my gear. 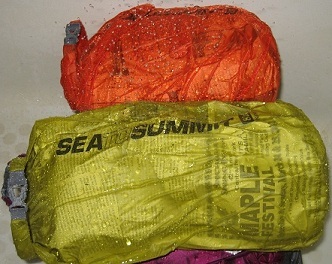 Thank you to Sea to Summit and BackpackGearTest.org for the opportunity to test the Ultra-Sil Nano dry sacks. I really enjoyed testing these dry bags and look forward to using them on future trips.